When I was 13, I used to take daily walks on this massive trail that went near the apartments we lived in, which took at least an hour-and-a-half to traverse. Along this trail was a very short tunnel that went under a road, and one day, I noticed that there was something doodled in that tunnel: “so much blood from such a tiny little hole.” I am young enough that it was incredibly easy to simply go home and look that lyric up, and I discovered that it was from “The Downward Spiral” by Nine Inch Nails. Not long after this, I went to Fred Meyer to attempt to buy this album – only to be turned down because, really, who wants to sell a Nine Inch Nails record to a 13-year-old? “My parents won’t allow it – they’re Nazis,” I told the clerk, who looked to be maybe four years older than I was. She didn’t budge. It wasn’t a big deal – I had the thing, I just wouldn’t buy it. This story is unique for me because, unlike the experience of choosing between Muse and Modest Mouse, this decision did nothing to affect my personal time line. In fact, if pressed to tell you what I bought instead, I probably couldn’t – what happened after I was unceremoniously denied was nowhere near as important as that act. This story is nothing compared to the inner struggle of Trent Reznor, and even in the pit of despair that I seemed to have taken up Vegas-style residence in, I knew that there was further down to go – and Nine Inch Nails was it. Over time, Nine Inch Nails became a background companion in my life. I ho-hummed with the best of them about what a weak release With_Teeth was, and rejoiced at how truly good Year Zero was (confession: I stole that record from Fred Meyer after it came out, as a small bit of revenge. It is only now that I remember that I stole it along with a copy of Se7en, which actually had Nine Inch Nails music in it – how strange!) I sat atop the stairs in a house in Northeast Portland, attempting to download the surprise release The Slip, before giving up and simply going down the street with my laptop to get it from somewhere that had WiFi. I never got the chance to see NIN, but something about Trent Reznor’s music has always brought me a small degree of comfort, despite the fact that I likely would not include them in my Top 20 favorite bands. To me, this is the best way to enjoy those records: at arm’s length. Those are albums you didn’t want to truly get inside you. Once NIN was over, Reznor started doing truly incredible things. He won himself an Oscar and a Golden Globe, for the score he did for The Social Network, David Fincher’s too-good-for-words Mark Zuckerberg biopic. Then a Grammy, for score for The Girl With the Dragon Tattoo. He defended the necessities of the major label, and started up a brand new band, with his brand new wife, former West Indian Girl vocalist Mariqueen Maandig and long-time collaborator Atticus Ross, called How To Destroy Angels. After two EPs, it was hard to really grab onto the difference between Nine Inch Nails and this new outfit, other than the fact that there was a woman singing the songs instead. The churning, industrial aesthetic was still there – just with a different voice. However, now, there’s a full-length album to show us what they’ve all been up to. 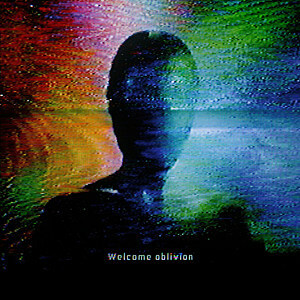 Welcome Oblivion clearly picks up where The Slip left off. On that album, Reznor somehow tapped into a strange dissonance, where everything was clearly industrial in nature, but the beats and blips sounded like they were grown, rather than created. “Keep It Together” grows out of muddy downbeats, and the energy of the track feels like it was raised from infancy right before your very eyes. There’s a sickly, lurching calm in Maandig’s voice as she whispers over the sputtering: “I can not keep it together,” she repeats, joined solemnly and unassumingly by Reznor. It’s disorienting, and it’s hard to shake a feeling that there’s something hanging just above your head, or right behind your back, not waiting to strike, but ready for something. “And the Sky Began To Scream” feels this way as well, though it feels like a monster underneath your bed – and that monster is just as obsessed with the wobbler bass effect that you and Mary Ann Hobbs. These are not songs made for dissent – these songs are made for slightly fucked up lovers. This is a feeling that’s hard to shake when, a lot of the time, Reznor creeps in, just there in the background, where you know he’s there, but you can’t quite get him in focus. Then something out-of-nowhere happens, and five songs in, “Ice Age” shows up. Do you remember, about halfway through Portishead’s Third, when a ukulele song shows up? This is exactly like that. Sweet little strings blip in and out, as Maandig coos about the ocean, and the color of your eyes. It’s a lot creepier than it sounds, but after the tracks before it, it’s a song that feels a lot like whiplash, especially when she sings a line like “Sometimes the hate in me is keeping me alive.” It feels even crazier when we dive back into the world that we were in before, with “On The Wing,” which is just as subdued, but with a vocoder’d haze to go with it. The height of energy comes in the form of “How Long” and “Strings & Attractors,” which present themselves as being tracks that could have been club bangers in another life, but are happier being here. That energetic peak only lasts for 11 minutes of the album’s 60-minute run time, until it dives back into the haze and honey. Welcome Oblivion never quite rises out of that haze – though this isn’t a bad thing. How To Destroy Angels is another version of the truth that is Nine Inch Nails, if that truth were really obsessed with Loveless. On the slow-burning, seven-minute closer, “Hallowed Ground,” the band sees you out with a wash of static feedback and whitewash, and by the time that track finishes, it’s hard to even believe that it was seven minutes. That’s exactly how the entirety of the album feels – it never feels like you’ve spent an hour on the record, which is definitely a very good thing. Those first two EPs might have felt like a sign that Reznor had lost his edge, but the reality is miles away from it. It feels like, instead of losing his edge, he’s just found a brand new, increasingly interesting edge.